Along with vocabulary, grammar is one of the key language areas that enables communication and language learning. However, learning grammar rules and using them successfully in speech and written form, as well as teaching them can be a challenge to students and teachers alike. 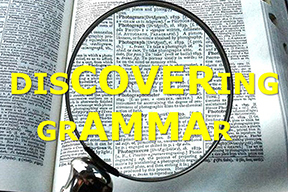 Nowadays there are two main approaches to teaching grammar: the traditional (deductive) approach and the discovery (inductive) one. At first, before research began on language learning, methods that were used to teach foreign languages were based on the Classical Method (the Grammar Translation method) previously employed for teaching Latin and Greek. The studying of classical languages was thought of as "mental gymnastics". Students were forced to memorize declension and conjugation patterns, vocabulary lists, and other grammatical rules. Translations and drills remained the only use of students’ language, while pronunciation and conversational skills were ignored. However, later on, after the United States became involved in World War II, the military realized that Americans needed to be able to speak foreign languages rather than merely read them. This is how The Army Method, later known as the Audio-Lingual Method came into being. It was actually based on linguistic theory and focused on oral and aural skills including conversation practice, with little to no exposure to grammar. Several schools today employ techniques that are a combination of the Grammar-Translation and Audio-Lingual methods. How do we present grammar today? Two very distinct and opposing instructional approaches are deductive and inductive. After the teacher has introduced and explained concepts to students, they are expected to complete tasks to practise the grammar. Later, they start practising using the grammar rules in speaking activities. This approach is mainly focused on talking ABOUT the language rather than talking IN the language. Here the meaning comes first, then the form is introduced. The students are led to the grammar through a series of steps. This is called the discovery technique. The approach is that students are led towards a generalized grammar rule or pattern. The teacher presents the students with a variety of examples for a given concept without giving any preamble about how the concept is used. As students see how the concept is used, it is hoped that they will be able to determine the grammar rule. As a conclusion to the activity, the teacher can ask the students to explain the grammar rule as a final check that they understand it. Both approaches can offer certain advantages, but the biggest difference is the role of the teacher. A deductive classroom is very teacher-centred, whereas an inductive one is much more student-centred. Inductive language teaching provides opportunities for students’ cognitive learning through discussion, discovery and finally understanding. Thus, language study arises out of extensive skills work. It is important to understand the difference between these two approaches. They both have their advantages and disadvantages. When choosing, the teacher should consider a number of factors. How personalized should the learning be? Students will usually be more involved in the learning experience and tend to participate more actively when an inductive approach is used. How much time is available to teach the material? The deductive approach is faster and can be an efficient way to teach large numbers of facts and concrete concepts. However, if we have more time and want to involve our students more , we can consider using the inductive approach. In conclusion, a good teacher should combine both approaches depending on what aim he/she wants to achieve.